Conference events like SXSW EDU are the best place to network because they provide the perfect environment for establishing new connections. 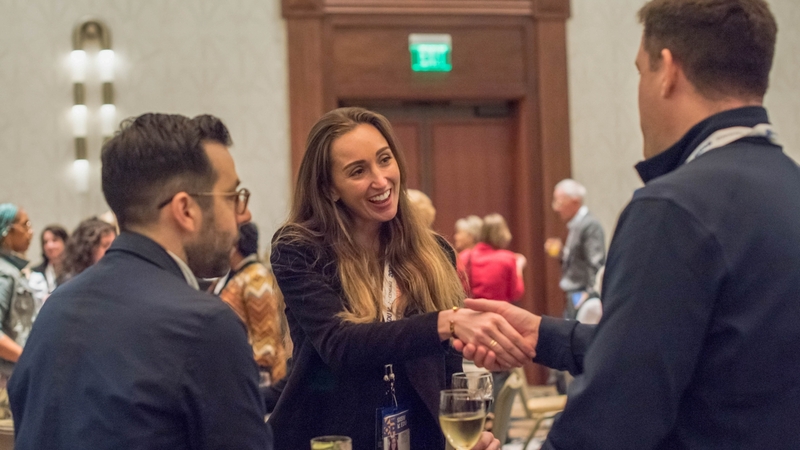 Before you board your flight and make your way to Austin, read through our tips to maximize your networking opportunities before, during, and after the event. Don’t underestimate the power of social media for establishing and building connections. Statistics show that social media engagement spikes dramatically during live events. Take a moment to tell your friends and followers that you plan to attend the event. Don’t forget to use the official hashtag, #SXSWEDU. During the conference ask questions, share reactions, quote speakers, and more to increase your online interactions. *Pro Tip: Set your SXSW EDU Schedule to public and retrieve your “My Schedule Link” so that you can post your list of favorited sessions and events on social media. The hotels located nearest events often become hotbeds for connecting and networking. Roughly half of the programming during SXSW EDU takes place at the Hilton Austin Downtown which is across the street from the Austin Convention Center. The Hilton in particular buzzes with energy from the lobby restaurant and coffee bar to the programming floor at all hours of the day. The Fairmont Austin is another great option because it is connected directly to the convention center with a sky bridge. It’s notable to mention that networking events including mixers, parties, dinners, and activities are sometimes scheduled to take place in the conference hotels. Not to mention, staying in the hotel closest to programming will give you a few more minutes of sleep in the morning so you are at your best throughout the day. What is the best thing that you have attended so far here? Take advantage of the SXSW EDU directory to find out who is attending, learn more about them, and reach out. The SXSW EDU directory is housed in EDU Social. To access this resource you must be registered to attend the Conference & Festival. Once you’ve purchased your registration sign in to create or update your profile and link your badge. The registrant directory allows you to search by country, industry, tag, and networks. This feature is also available in the mobile app once your accounts have been synced. Time flies during a conference and we all want to make the most of it. Think of your introduction like an elevator pitch. This will help you make a good first impression and encourage the person that you are talking to do the same. Remember your W’s (who, what, where, when, why). One of the biggest benefits of downloading the SXSW EDU mobile app is the attendee match feature. Attendee match delivers personalized attendee recommendations based on your personal profile and profile tags. 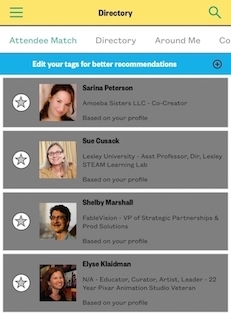 Add self-selected tags to your profile through the app or using EDU Social to help inform your matches. This is a great way to discover new connections who share your interest without having to browse the entire directory. The SXSW EDU mentor program pairs experienced professionals with solution-seeking attendees for one-on-one meetings. Mentor meetings are 12-minutes and provide a rare opportunity to connect with professionals ready to share their insights. Mentor meetings are first come, first served and you must RSVP for your spot in advance of the event. RSVPs will open in February, keep an eye out for more information. Never let wait time go to waste. Make yourself approachable by setting down the phone or computer and appearing open. Refer back to the conversation starters listed above for a great starting point. Networking at conferences can feel overwhelming at times but follow these tips and you’ll find it’s easier than you expected. Keep an eye on SXSW EDU for more information about networking tips, tools, and events. Follow us on Twitter, Facebook, Instagram, and LinkedIn for even more!